If I had won a debate with the XMan 17 years ago, this would be the date for the 37th Annual Polish Olympics. Instead, I am looking back in nostalgia at one of the greatest events created by mortals - the Polish Olympics. It took place every second Saturday in February in Cleveland from 1974 to 1993. In 1974, when I was 5 months old, the XMan gathered approximately 25 of his closest friends to play games, eat kielbasa and drink beer in my basement. It was the first Polish Olympics, in which I believe John Sondej, who often wears shorts in wintertime, won. However, it might have been that my Uncle Steve Warner won the first Olympics. I don't recall the exact champ. I was only 5 months old. The Polish Olympics took off because of its gorgeous blend of Polish cuisine, beer and games. Having more than 40 entrants was the norm, and in the mid-1980s, the event had to be moved to a hall called the Mary Rybicki Building. The event developed a life of its own and culture, in which some competitors vaguely changed identities for it. I remember that Chuck Withrow, a successful ad man in Cleveland, won the Olympics multiple times and was the Babe Ruth of the Polish Olympics. To win the Olympics was a feat; to win it more than once was godly - partly because luck was a huge factor. In the final Polish Olympics in 1993, the events were darts, dice toss, Facts in Five, penny pitch, poker, Polish bingo, putting, Skittle Bowl, softball throw and Yahtzee. 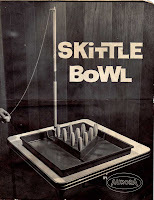 I loved Facts in Five and Skittle Bowl the most because 1) those are cool games and 2) it was the only time of the year anyone would play those games. My least favorite event was putting, and in retrospect, putting was a sign that my parents were transitioning from Polacks to golfers. Also, in retrospect, the running of the Polish Olympics coincided with the running of my childhood. Soon after the Olympics, I graduated college, moved to New York, then L.A. When the XMan ended the Olympics after 20 installments, I implored him to keep it going, but he said 20 were enough. Maybe it was time to move on. This many years later, I yearn to bring back the Olympics but do not know if it's possible. I might try some sort of Olympics in Long Beach, Calif., but I don't think the perfect blend of competition, kielbasa and ridiculousness will ever match that for the original 20 Polish Olympics. Na zdrowie!